Series of syllables which have been learned by heart, forgotten, and learned anew must be similar as to their inner conditions at the times when they can be recited. The energy of the ideational activity which is directed upon them and which serves to establish them is in both cases so far heightened that quite similar combinations of movements occur in connection with them. For the period after the recital this inner similarity ceases. The series are gradually forgotten, but -- as is sufficiently well known -- the series which have been learned twice fade away much more slowly than those which have been learned but once. If the re-learning is performed a second, a third or a greater number of times, the series are more deeply engraved and fade out less easily and finally, as one would anticipate, they become possessions of the soul as constantly available as other image-series which may be meaningful and useful. I have attempted to obtain numerical data on the relation of dependence which exists between the permanence of retention of a series and the number of times it has been brought, by means of renewed learning, to a just possible reproduction. The relation is quite similar to that described in Chapter VI as existing between the surety of the series and the number of its repetitions. In the present case, however, the repetitions do not take place all at once, but at separate times and in ever decreasing frequency. On account of our limited insight into the inner connection of these processes we would not be justified in venturing an assertion about one relation on the basis of the other. Only one value of the time interval between the separate re-learnings was chosen, namely, 24 hours. Instead of changing intervals, series of different lengths were chosen for the investigation, the lengths being 12, 24 and 36 syllables. A single test consisted of nine series of the first length, or three of the second, or two of the third. 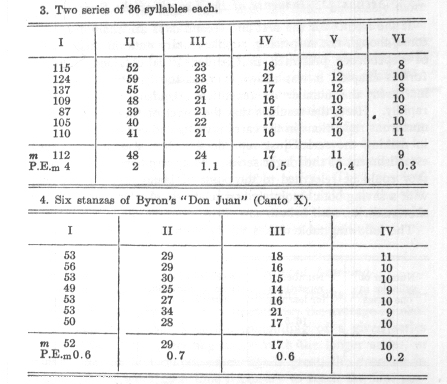 In addition to this I carried out several tests with six stanzas of Byron's "Don Juan." The plan of the experiment was, then, as follows: The required number of series was first learned and then, at the same hour on successive days, it was relearned to the point of first possible reproduction. In the case of the series of syllables, the number of days was six; in the case of Byron's stanzas, it was only four. Thus, on the fifth day, the stanzas were correctly repeated without any preliminary reproduction and the problem, accordingly, no longer existed. For each kind of series, seven trials were employed. The total number of separate tests was, in con-sequence, 154, a number of which required only a few minutes for their execution. 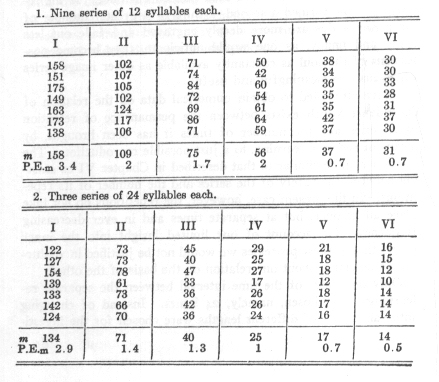 The entries of the following tables indicate the repetitions which were necessary in order to bring the series concerned to the first possible reproduction (including this); the Roman figures designate the successive days. In order to bring out more dearly the separate relations which exist between the resulting averages, it is necessary to reduce the total figures to the same unit -- i.e., to divide them in each case by the number of series constituting a single trial. If this is done and the repetition necessary for the recital is deducted, the following table results, fractions being given to the nearest half or quarter. From several points of view these numbers require further consideration. If the results for the first and second days are examined, welcome, though not surprising, supplementary data on the relation of dependence presented in Chapter V is obtained. In the former chapter, it was shown that, as the length of the series increased, the number of repetitions requisite increased very rapidly. Here, the result is that the effect of this need of more numerous repetitions in the cases investigated consists not merely in making the series just reproducible, but also in the firmer establishment of the longer series. After an interval of 24 hours they could be relearned to the point of being just reproducible with a saving both absolutely and relatively greater than with the shorter series. The following table makes this relation clear. The saving in the case of the shortest of the series investigated is one third for the second learning as compared with the first; while with the longest series, it is six tenths. It can be said, therefore, that by being learned to the first possible reproduction the series of 36 syllables is approximately twice as firmly established as the series of 12 syllables. In this there is nothing new. On the basis of the familiar experience that that which is learned with difficulty is better retained, it would have been safe to prophesy such an effect from the greater number of repetitions. That which probably would not have been anticipated and which also demands attention, is the more definite determination of this general relation. So far as the numbers go, they seem to show that, between the increase of the repetitions necessary for the first learning and the inner stability of the series effected by them, there is no proportionality. Neither the absolute nor the relative saving of work advances in the same way as the number of repetitions; the former advance much faster and the latter noticeably more slowly. It cannot, therefore, be said in any exact sense of the words that the more frequently a series needs to be repeated to-day in order to be learned by heart the more repetitions will be saved in its reproduction after 24 hours. The relation in force seems to be much more complicated and its exact determination would require more extensive investigations. The relation of repetitions for learning and for repeating English stanzas needs no amplification. These were learned by heart on the first day with less than half of the repetitions necessary for the shortest of the syllable series. They acquired thereby so great stability that for their reproduction on the next day proportionally no more work was needed than for the semi of 24 syllables -- i.e., about half of the first expenditure. We will now take into consideration the results for the successive days taken as a whole. On each day the average number of repetitions necessary for the committing of a given series is less than on the preceding day. With the longer series, in whose case the first output of energy is great, the decrease in the amount of work each time necessary to reach the first possible reproduction is proportionally rapid. With the shorter series, where the first output is small, the decrease is proportionally slow. On this account the numbers of repetitions necessary for the different series approach each other more and more. With the series of 24 and 36 syllables this is apparent even from the second day; from the fourth day on, the numbers fall absolutely together. And by the fifth day they have approached very closely to the number of repetitions still necessary, in accordance with the slower decrease, for the learning of the 12-syllable series. Nevertheless the course of the numbers cannot be described by a simple formula. Rather is this the case if one takes into consideration, not the gradually decreasing necessity for work, but the just as gradually decreasing saving of work. Of these numerical sequences two -- namely, the second and fourth rows -- form with great approximation a decreasing geometrical progression with the exponent 0.5. Very slight changes in the numbers would be sufficient fully to bring out this conformity. By slight changes, the first row might also be transformed into a geometrical progression with the exponent 0.6. On the contrary, a large error in the results of investigation would need to be assumed in order to get out of Row 3 any such geometric progression (whose exponent would then be about one third). If not for all, yet for most, of the results found, the relation can be formulated as follows: If series of nonsense syllables or verses of a poem are on several successive days each time learned by heart to the point of the first possible reproduction, the successive differences in the repetitions necessary for this form approximately a decreasing geometrical progression. In the case of syllable-series of different lengths, the exponents of these progressions were smaller for the longer series and larger for the shorter ones. Although the tests just described were individually not more protracted than the others, yet relatively they required many days, and the average values were consequently derived from a rather small number of observations. So here, even more than elsewhere, I am unable to affirm that the simple conformity to law approximately realised in the results so far obtained would stand the test of repetition or wider extension of research. I content myself by calling attention to it without emphasis. The problem of the present chapter is, as has already been pointed out, closely related to that of Chapter VI. In both cases the investigation concerns the influence of an increasing number of repetitions on the fixation of the series of syllables, a fixation made increasingly stronger thereby. In the former case the total number of repetitions immediately succeeded each other without regard to whether the spontaneous reproduction of the series was obtained through them or to how it was obtained. In this case the repetitions were distributed over several days and tile attainment of the first possible reproduction was employed for their apportionment on the separate days. If, now, the results obtained in both cases have, at least for my own personality, any wider validity, we should expect that in so far as they are comparable, they would harmonise. That is, we should expect in this case as in the former that the effect of the later repetitions (therefore, those of the 2nd, 3rd, and later days), would at first be approximately as great as that of the earlier, and later would decrease more and more. A more exact comparison is in the nature of the case not now possible. In the first place, the series of Chapter VI and the present ones are of different length. In the second place, the detailed ascertainment of the effect of the repetitions of the successive days taken solely by themselves would be possible only through assumptions which might be plausible enough on the basis of the data presented, but which would be easily controvertible on account of the insecurity of these data. We found, for example, that nine 12-syllable series were learned on six successive days by means of 158, 109, 75, 56, 37 and 31 repetitions. The effect of the first 158 repetitions is here immediately given in the 109 repetitions of the succeeding day in the difference, 158-109. But if we wish to know the intrinsic effect of these 109 repetitions, namely the saving effected by them, on the third day, we could not simply take the difference, 109-75. We should need to know, rather, with bow many repetitions (x) the series would have been learned on the third day if no repetitions had occurred on the second, and we should then have in the difference, x-75, the separate effect of the 109 repetitions actually given. Since the forgetting increased somewhat from the second to the third day, x would be somewhat greater than 109. In the same way, for the determination of the effect of the 75 repetitions of the third day, we should need to learn in some way or other with how many repetitions (y), the series would have been learned by heart on the fourth day which, on the first day, required 158; and on the second, 109. The difference, y-56, would then give the measure of that effect; and so on. For the ascertainment of x, the results of Chapter VII give a certain basis. There the result was that, in the case of 13-syllable series, the amount forgotten at the end of 24 hours was to that forgotten at the end of 2x24 hours as 66 to 72. But the employment of this relation, itself insecure, would be justifiable only in case of the 12-syllable series, and would accordingly not help in the determination of y, etc. One could at the best suppose that the resulting quotients would approximate yet more closely to unity. Accordingly I renounce these uncertain assumptions, and content myself with presenting the relations of the successive repetitions to the successive savings by showing that the presupposed pure effect of the separate repetitions would be represented by somewhat greater and presumably less divergent numbers. Although the course of these figures, which are, as has been said, inexact as to their absolute values, is tolerably regular in the case of the 24-syllable series only, its general character agrees very well with what would be expected from the results of Chapter IV. The effect of the repetitions is at first approximately constant, the saving in work which results from these repetitions increases accordingly for a while proportional to their number. Gradually the effect becomes less; and finally, when the series has become so firmly fixed that it can be repeated almost spontaneously after 24 hours, the effect is shown to be decidedly less. The results of the fourth and the present chapter, as far as can be seen, Support each other. Nevertheless, there is a noteworthy distinction to which I call attention. We found above (p.60 [end of Chapter VI]) that six 12-syllable series, which had been learned at a given time with an average of 410 repetitions, could be learned by heart at the end of 24 hours with, on the average, 41 repetitions. For a single 12-syllable series, accordingly, 68 immediately successive repetitions had the effect of making possible an errorless recital on the following day after 7 repetitions. In the present research with distribution of the repetitions over several days the same effect appears on the fourth day: 9 12-Syllable Series were learned by heart with 56 repetitions. Each series, therefore, was learned with about 6 repetitions. But the number of repetitions which were necessary for the production of this effect in the case of the nine series amounted to only 158+109+75=342. For a single series, therefore, the number was 38. For the relearning of a 12-syllable series at a definite time, accordingly, 38 repetitions, distributed in a certain way over the three preceding days, had just as favorable an effect as 68 repetitions made on the day just previous. Even if one makes very great concessions to the uncertainty of numbers based on so few researches, the difference is large enough to be significant. It makes the assumption probable that with any considerable number of repetitions a suitable distribution of them over a space of time is decidedly more advantageous than the massing of them at a single time. With this result, found here for only very limited conditions, the method naturally employed in practice agrees. The school-boy doesn't force himself to learn his vocabularies and rules altogether at night, but knows that be must impress them again in the morning. A teacher distributes his class lesson not indifferently over the period at his disposal, but reserves in advance a part of it for one or more reviews.